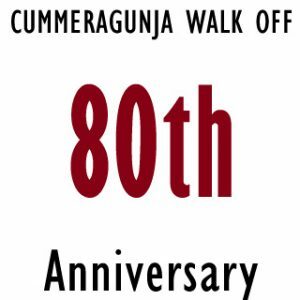 To celebrate the 80th Anniversary of the Cummeragunja Walk Off, there will be a 3day event held on the 2nd, 3rd and 4th of February at Cummeragunja, Barmah, Victoria. 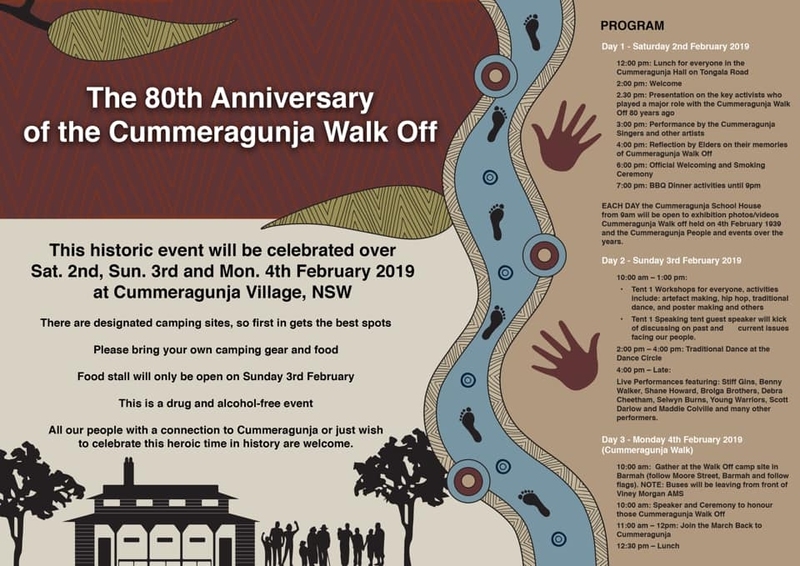 On the 2nd, 3rd and 4th of February 2019 we will be holding celebrations for the 80th Anniversary of The Cummeragunja walk off. This event will be taking place on the Cummeragunja Reserve across the first weekend of February, with workshops, food and performances throughout. It would be great to have all the mob join in with the celebrations. All families are welcome to camp with designated camping areas being set up around Cummeragunja. The most significant day of the celebrations will be the 4th of February which is the Anniversary date of the Walk Off. We invite all the mob to join us while we march back onto community at 11am. The Walk on will be held in honour of the descendants of Cummeragunja who survived the struggles and took a stand against the ill treatment by White Mission Managers of the time, this is a symbolic gesture demonstrating that the Cummeragunja Community is a strong proud community that has over come many struggles but our connections to our country have remained strong. This is our land and we are here to stay. Cummeragunja Reserve or Cummeragunja Station, alternatively spelt Coomeroogunja, Coomeragunja, Cumeroogunga and Cummerguja, was an Australian Aboriginal reserve established in 1881 on the New South Wales side of the Murray River, on the Victorian border near Barmah. The people were mostly Yorta Yorta.